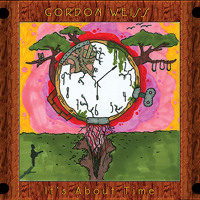 Gordon Weiss has a new album out titled It’s About Time. I find that title very appropriate considering it has been 7 years since he released his last recording. However I think there can be more than one more meaning in that song. Once again musical/studio wizard Jeff Canatta provides his talent in the production phase of the album as well as contributing musically. Weiss is the kind of artist that wears his influences on his sleeve and those influences are ingrained in his soul, you can hear it in his music. He plays guitar, piano, bass, keyboards, balalaika and percussion throughout the album. His talent is quite apparent and his voice is very distinctive. The first two tracks come bursting out of the gate with energy and a decisive direction. “The Ugly Inside” is an excellent way to kick off the album showcasing the all-around talent of Weiss. Its highly energetic approach and fast pace get in you in the right frame of mind and essentially set you up for what is to come. “I’m Your Fan” (featured on RateThe Tracks) is a radio ready pop-rock tune with all the essential elements. With lyrics and music to match it makes for the perfect ear candy. “Sticky Thoughts” is drama and truth set to the perfect musical setting. The piano, bass and drums are the screen the actors portray their characters upon. It’s not hard to see this kind of thing in your mind’s eye. Only good music is able to produce the proper images that the words suggest and I find the music of Mr. Weiss to be an appropriate answer to that question. In other words, he gets the job done very well. My ears and senses always appreciate a multi-talented artist like Gordon Weiss. “About Time” is another great tune that dives into the conceptual piece of this recording. I liked the way the song builds up slowly then launches into a faster paced guitar with an organ, bass and drums to drive it to the next level. Then when it reaches a climax it steps back and slows down for further introspection then forces you to listen closer to the words. It is the perfectly crafted pop-rock track and it pays tribute to the fab four nicely. There are complex tracks such as “Thanks I Get” and “Spinning ‘Round” that offer several layers of instrumentation and apexes of sound that are remarkably entertaining and progressive. It shows a musician/songwriter in his element bringing all of the talents he has to the forefront to create virtual musical magic. If you can recall The Beatles album Rubber Soul and how they were changing and getting more complicated with their presentations, then perhaps when you hear those two tracks and find parallels. What I truly love about covering artists like Weiss is I never forget. They leave me with a great impression and always touch base to let me know there is some new music to enjoy. It’s About Time never disappoints, it is consistently solid throughout, the words and music tell a story and it makes you want to hear it all over again. It is funny how he says in the “Great Imitator” “If I wrote Hey Jude, would they say it's too Beatley?” Well it works for me and I like the way he slides that in there to remind you from whence he came. This is great pop-rock album that deserves more than one spin.